Jean Pereira, Business Development Manager, HYPOXI Training Equipment L.L.C. ; Uwe Hintringer, Director of Sales & Marketing, HYPOXI Headquarter Salzburg; Allison Pickford, Director, HYPOXI Training Equipment L.L.C. ; Kevin Pickford, CEO, HYPOXI Training Equipment L.L.C. Today, HYPOXI UAE announced it has been awarded the official and exclusive distribution rights for the entire MENA region in addition to Seychelles, Mauritius and Maldives. Owing to the expertise and success of operating HYPOXI in BodySmart, a boutique slimming studio, for over 13 years, Allison Pickford, Founder and Director of BodySmart, acquired the Exclusive Distribution of HYPOXI in the UAE in July 2014. 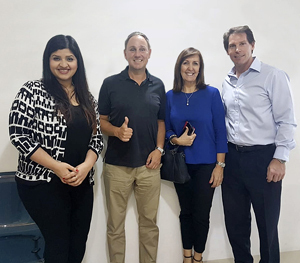 HYPOXI MENA has now partnered with a local leasing company which will bring along great opportunities owing to several years’ experience in the financing sector in the Middle East. Pickford proudly declares, “There are exciting partnerships planned in the future that will really take the HYPOXI brand and ethos which is ‘the most targeted method for a beautiful body’ to the next global level”.